This mirror reflects the artistic creativity that characterizes the elegant and prosperous Tang period. The art of mirror-making in China originates as early as the Warring States and Han periods (480 BC-AD 220), and achieved its pinnacle during the Tang dynasty. This crisply cast square mirror depicts the animal and grapevine pattern which was a popular motif of the period. Bunker and Rawson suggest the pattern was derived from the vine scrolls first seen in China on metalwork of the Fifth century, found near Datong in Shanxi Province. There is slight alteration to the surface resulting from prolonged burial and exposure to soil mineral elements. 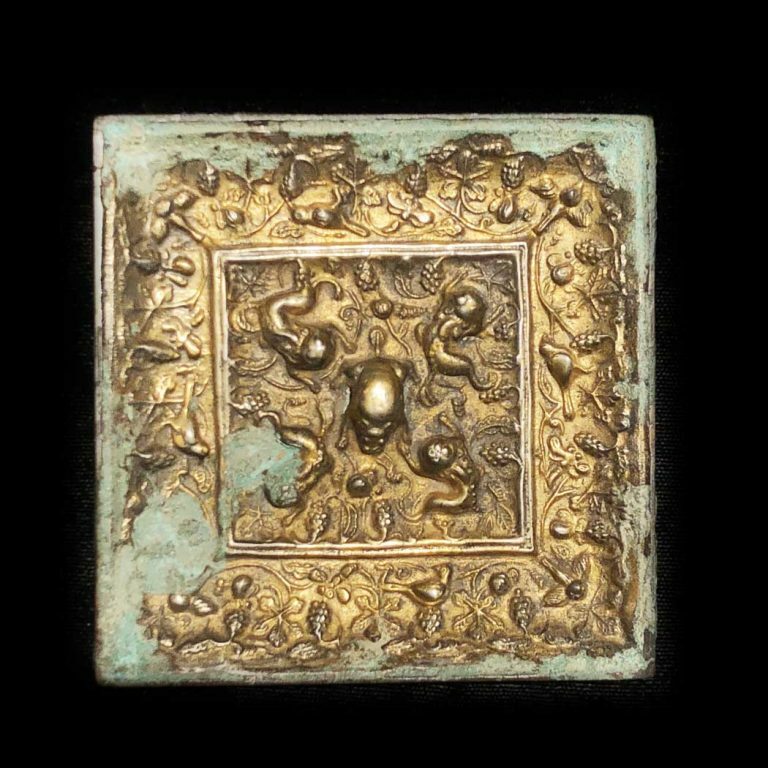 Square mirrors, of which this is a superb example, are rare in the Tang period. In the eighth century, increasing insecurity along the frontiers and internal distress interrupted the importation and mining of precious metals, leading in the year 756 to an edict prohibiting production of objects with gilded or inlaid decoration. The edict marked a decline in precious metalworking which increased the appreciation for metal objects being produced. In our opinion, the design and intricate workmanship of this mirror exemplify outstanding metalwork of the Tang dynasty. Published: Collecting Chinese Art. Sam Bernstein. Seattle: University of Washington Press, 2000. Page 50 plate 49. For a similar square mirror dated Tang dynasty, see Private Passions: Connoisseurship in Collecting Chinese Art. Sam Bernstein. San Francisco: S. Bernstein & Co., 1998. Plate 15. For a related example of the period, see Ancient Chinese Ordos Bronzes. Jessica Rawson and Emma Bunker. The Oriental Ceramic Society of Hong Kong, 1990. Pg. 260, Plate 180. See the discussion of Tang mirrors in Ancient Chinese Bronze Mirrors, Robert W. Swallow and Fred Bleicher, Ars Ceramica, Ann Arbor, 1977. Pgs. 51-54. The metalwork of the Tang is discussed in “Tang Dynasty Gold and Silver,” Clarence W. Kelly, in Orientations, March 1985, Pgs. 10-17. There is a silvered bronze mirror of similar subject matter illustrated in Ritual and Belief: Chinese Jade and Related Arts. Sam Bernstein. San Francisco: S. Bernstein & Co., 1994. Plate 29.